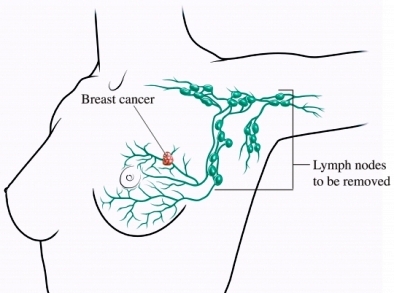 The lymph system is a series of organs, vessels, nodes, and fluids. This system creates and carries fluids that play an important role in the immune system and maintaining the balance of fluids in the tissue. Lymphedema is a build up of fluid normally transported by the lymph system. The fluid build up leads to swelling in the affected area. While lymphedema occurs most often in the arms and legs, it can eventually spread to the core of the body and head. Lymphedema can range from mild swelling to swelling that dramatically increases the size of the limb and causes skin discoloration. Lymphedema is caused by defect, damage, or infection of an area in the lymph system. Secondary lymphedema develops when there is injury, infection, or nearby growth that blocks the flow of fluids in the lymph nodes or lymph vessels. It may be caused by medical conditions, medical treatments, or trauma. Lymphedema is more common in older adults. Lymphedema can also lead to complications like a breakdown of the skin, infections of the skin, or massive changes in the size and shape of the limb. The doctor will ask about any symptoms and medical history. A physical exam will be done. The degree of swelling can be tested by pressing a finger into the swollen area. The indent in the skin will indicate the severity of swelling. Measurements will also be taken around the affected limb and compared to the healthy limb. The doctor may diagnose lymphedema based on the swelling and appearance of the skin and medical history. Lymphangiography is a test that uses a radioactive dye to create images of the lymph system but it is rarely used. Treatment will depend on the severity and cause of lymphedema. Some causes may respond to treatment and stop causing lymphedema, but most will have a continued risk of lymphedema. Initial treatment may require more intensive treatment over a few weeks. A long-term plan will be developed once initial goals are reached. Long-term plans will include understanding factors that may worsen swelling . Managing lymphedema flare up early may prevent complications. Exercise—Light gradual strength training can help decrease swelling. The doctor or a physical therapist can suggest a program that will not make swelling worse. Compression—Special stockings, sleeves, or elastic bandages can help provide constant gentle pressure over the affected area. Some devices will adjust as the swelling goes down. The doctor or therapist will discuss different options to help find one that is best for each situation. Manual therapy—A certain type of massage may help move fluids. A therapist can teach the proper technique to avoid adding more fluid to the affected area. The therapy may not be appropriate for all conditions, especially those with cancer present. Pneumatic compression—A device creates pressure at regular intervals using a sleeve over the affected arm or leg. A combination of treatments may provide the best results. A method called complete decongestive therapy combines the methods above plus the lifestyle habits and education below. Different methods will be tried until the best method or combination for each individual is found. Reaching or maintaining a healthy weight—Obesity can increase the risk of lymphedema and impair fluid flow. Healthy nutrition guidelines—Certain foods can increase fluid retention in the body. Good nutrition choices will also affect overall health and weight. Keeping affected arm or leg clean. Keeping hands and feet protected by wearing gloves and shoes. Using an electric razor to shave to decrease cuts to skin. Using sunscreen when outdoors to prevent burns. Avoidance of actions or activities that may further impair lymph fluid flow in the area. Avoiding blood draws or blood pressure measurements on affected arm or leg. Avoiding positions that impair flow of fluid like crossing legs or carrying items on shoulder if either area is at risk. Avoiding ice or heat treatments to the affected areas. A medical bracelet can let medical professionals know about risk for lymphedema. This may keep them from performing tasks that may make swelling worse. Surgery may be needed for severe lymphedema. The goal of surgery is to unblock the lymphatic system and help reduce swelling. Doctors or physical therapists will work with you if you are at risk for developing lymphedema because of medical treatments or conditions. Certain lifestyle changes and monitoring may prevent the development of lymphedema. If you had lymph nodes in your armpit removed during cancer surgery, a strength and physical activity program in recovery may help prevent lymphedema. Lymphedema. Society for Vascular Surgery website. Available at: https://vascular.org/patient-resources/vascular-conditions/lymphedema. Updated December 2011. Accessed March 26, 2018. Lymphedema—approach to the patient. EBSCO DynaMed Plus website. Available at: http://www.dynamed.com/topics/dmp~AN~T909498/Lymphedema-approach-to-the-patient. Updated October 18, 2017. Accessed March 26, 2018. Poage E, Singer M, Armer J, Poundall M, Shellabarger MJ. Demystifying lymphedema: development of the lymphedema putting evidence into practice card. Clin J Oncol Nurs. 2008;12(6):951-964. Torres Lacomba M, Yuste Sánchez MJ, Zapico Goñi A, et al. Effectiveness of early physiotherapy to prevent lymphoedema after surgery for breast cancer: randomised, single blinded, clinical trial. BMJ. 2010;340:b5396. Trayes KP, Studdiford JS, Pickle S, Tully AS. Edema: diagnosis and management. Am Fam Physician. 2013;88(2):102-110.